My Every Day Carry kit. As a kid I committed the Boy Scout motto, “be prepared,” to memory and did my best to live by it. Now that I’m an old Eagle, I still believe in being prepared, but I’m a lot wiser. I want to be ready for whatever comes my way, be it an emergency, an opportunity, or just a great time. I’ve found that having the right stuff with me is the best way to be prepared for any of these eventualities. Sure, in a perfect world it’s always best to have the proper tool at your disposal. In the less-than-perfect world we inhabit, however, pocket space is limited and a bag can only hold so much before it becomes a burden. It’s important to be selective about what we carry with us. Our Every Day Carry, sometimes abbreviated “EDC,” is the set of tools we always have at hand in our day to day life. Over the years I’ve experimented with, evaluated and tweaked mine, and I still continue to do so. The result is that my EDC suits my needs pretty well. I feel prepared. Do you? Are you ready for whatever comes your way, be it good or bad? If not, don’t worry; I’m going to review my EDC, and maybe this will give you a little input on what to add to or remove from your own. The holidays are quickly approaching, but there’s still just enough time to add these to your list for Santa, or to shop for someone on your gift list. Also, this post is launching my second giveaway, so be sure to enter to win! Now, onto what I’m hauling! My general Every Day Carry is what I’ve got with me any time I leave the house, unless I’m partaking in a specific activity. If you visit me in the office, out to dinner, taking a walk, or hitting the bar, this is the stuff I’ll have on me. 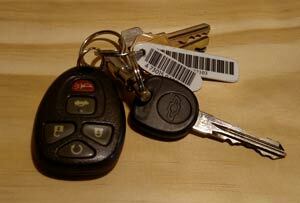 Keys: Obviously I need these to get around, but I don’t like to waste space. I don’t like big keychains, so everything extraneous has been removed. Just my car fob, car key, house key, and a few work related keys. I also don’t like membership cards on my keychain. It always starts with one, and then the next thing you know, you’ve got twenty of them. I’m not doing that; most places can look me up by phone number, so I’ve eliminated almost all of them. There are a few that I have to keep, but I’ve trimmed them down to about one third of the size, so less blank plastic is wasting my pocket space. Money Clip: At the moment, I don’t carry a wallet. I haven’t in several years actually, instead I carry a money clip that was given to me by one of my greatest friends when I was in his wedding. It has served me well for years, but here lately I admit that I have been considering transitioning back to a wallet. My money clip is starting to lose some of its springiness and tensile strength, and as I’m carrying a few more cards than I used to, a wallet may finally be practical for me. I’m still on the fence though; I love the lightweight simplicity of the money clip. There is no extraneous material in my pocket just to hold my cash and identification in place. It’s everything I need, and nothing that I don’t. Swiss Army Knife: In the fifth Rule for Intrepid Living, I discussed why you should always carry a pocket knife. I’m a big fan of my Spartan Swiss Army Knife. It’s very attractive in traditional red (though they offer a couple alternatives), has a variety of useful tools, and though the specialized stainless steel blades can be a pain to sharpen, they hold an edge really well, even when I abuse this knife. And to be clear, I do abuse it; there is seldom a day during which I don’t use my SAK. To be fair, there are plenty of Swiss Army Knives with more tools on them, and tons of multitools (Gerber, Leatherman, etc) that enable you to have a garage’s worth of tools on hand, but the Spartan SAK is the right balance for me. It has an assortment of uses without being too bulky in my pocket. I was having trouble with it sliding out of some of my slacks while sitting down at work, but a little paracord with a bowline tied in each end resolved that problem. The Spartan includes a large and a small blade, a can opener with a 3mm screwdriver tip, a bottle opener with a 5 mm screwdriver tip, a wire stripper, a reamer/awl, toothpick, tweezers, and a key ring. While I have used some more than others, there is no tool on my SAK that I haven’t used. I’ve taken apart a desk, fixed a computer, removed splinters, and opened cans of beans. Trust me when I say that you’ll be very popular if you are the only person at a party with both a bottle opener and a corkscrew in your pocket. Just make sure that no one runs off with your knife (someone will try). Need one of these? Keep reading to find out how you can win one in my Swiss Army Knife Giveaway! Handkerchief: I have a variety of handkerchiefs at my disposal. I have some very classy looking white ones that I carry with me to work as well as some swanky pocket squares for my suits and blazers. Then I have some classic cotton hankies that I take with me pretty much everywhere else. They’re super inexpensive and can be found almost anywhere, so if you wear one out, not to worry. Ironically, I don’t use my handkerchief to blow my nose unless absolutely necessary. It’s nice to have if I’m plagued by sneezing fits while I’m out on a hike, but if I’m at home, at the office, or at a restaurant, I’d rather excuse myself and deal with the trouble with tissue. No the handkerchief isn’t necessarily for my snot, rather it’s a multi-functional tool. I clean my glasses, mop my brow, or assist teary-eyed individuals. Over the years I have used hankies to clean up messes, dress wounds, gather berries, protect my head and neck from the sun, filter water, make a sling for an injured arm, and even as makeshift toilet paper when an emergency struck. More often than not, it just stays in my pocket and doesn’t get any use. Every so often, however, it makes an appearance and makes itself incredibly helpful. That’s why I always carry one. Chapstick: Pretty self explanatory; sometimes my lips get a little dry. I don’t use anything special, just a tube of whatever is handy. It’s also helpful should I need to address dry skin, take the sting out of a paper cut, or start a fire. Even without the potential for extra uses, chapped lips are unpleasant, right? Phone: This is also pretty self explanatory. I’m currently carrying a Droid Turbo, and I love it. The battery life is great, the camera is solid, and I have almost no problems with it. I’m not a fan of the fact that I can’t use mobile data while talking on the phone, but that’s more of a minor inconvenience than a real issue for me. Regardless of whether you’re toting an iPhone or an Android device, the smartphone has become ubiquitous these days. It’s handy to have instant communication available to us whenever we want, but it’s important to me that I’m the one controlling the phone, not the other way around. For that reason, I have almost no information pushed to me. I have my personal e-mail account synced to my phone but it won’t update new e-mails unless I ask it to. There are no alerts for facebook messages, tweets, or anything like that. I can check it any time I want, but only when I choose to. It’s one way to keep my head clear and stay more focused. Of course, I’m still active on social media, so I do have Twitter, Instagram, and even Facebook on my phone, just without push notifications. I live my life by my Google Calendar, so I have a handy widget for that and I give myself a lot of reminders care of Google Now. The most important thing about my phone, however, is that it lets me call my mother at least once a week. Do you do that? Think about starting. Watch: I own more watches than I need, and probably way more than I should. Lately, the watch that I’m wearing most often is this Timex Expedition Scout. Don’t mind my veiny hand, focus on the watch. Many people feel that the watch is antiquated on account of our cell phones. Maybe so, but despite my Droid’s long battery life, my watch battery lasts a lot longer. 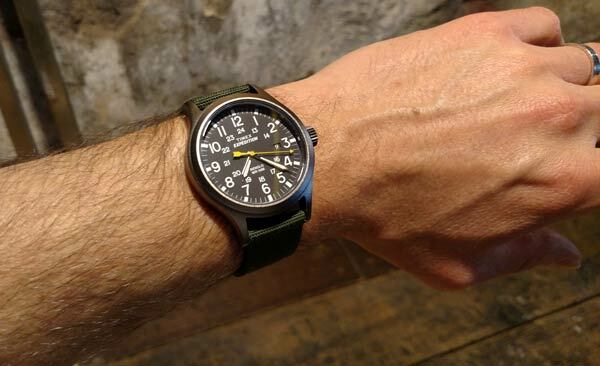 It’s just handy to wear one; it’s easier to tip your wrist and see the time without digging through your pocket, you can match it to your clothing or activity, it can be as plain or fancy as you like, and an analog watch can act as a compass in an emergency. My Timex is simple, waterproof up to fifty meters, and has a really attractive classic look to it. It’s equally at home in the office, the trail, the bar, or the hardware store. I know, because I’ve worn it to all of those places, and received compliments. Field Notes: I like to keep a small notebook handy; right now I use these cherry wood cover Field Notes. I prefer the grid paper to the the lined, should I need to doodle or design in addition to writing. Occasionally I actually write down a note that proves useful or is worthy of transcribing into my journal. The wooden cover actually looks pretty nice. I know that I could take notes in my phone with Evernote, but there’s something that I like about taking actual physical notes. The flaw is that I’ve yet to find a reliable, comfortable way to carry a pencil in my pocket that won’t break the point or stab my leg. If you have any suggestions, I’m all ears. In addition to what I haul around in my pockets, I almost always take a bag with me to the office, the library, or anywhere else I might do some writing, editing, or other work. 40+ hours a week is a significant chunk of time, so I value what I carry with me in my bag, just like what I’m carrying in my pockets. Here’s my work bag and it’s contents. The Bag Itself: Until recently I was carrying a Rothco Vintage Paratrooper Bag. I picked this up when I started my current job in May 2013. I just wanted a durable brown bag to sling over my shoulder for work, and the Rothco looked pretty cool. It stood up to the abuse I’ve heaped on it fairly well, and I’m not gentle on my bags. That being said, two years have given a healthy dose of wear and tear; one of the snaps has come off, and the canvas is starting to get thin in a few spots. There aren’t a lot of different pockets, and if you’re carrying a laptop, a tablet, binders, and books, this won’t carry all of your stuff very well. It’s definitely meant to be a lightweight bag, and the shoulder strap isn’t very thick, so if you’re hauling a lot of stuff, you’re going to be uncomfortable. For my needs, which is mostly notes for work, a few books here and there, and occasionally my laptop, my little Rothco served me well. I recently transitioned to a new work bag, however. 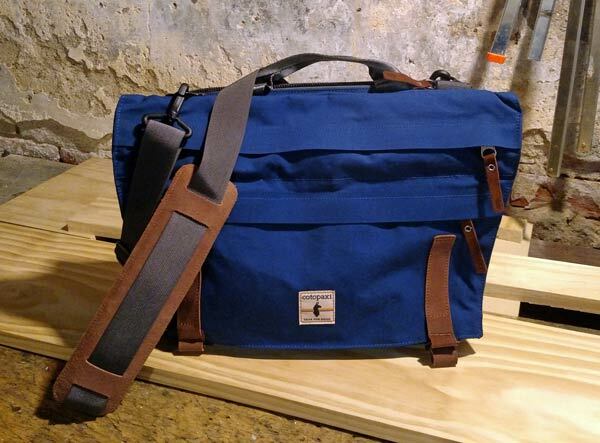 Now I’m carrying the Cotopaxi Kpang in Navy Blue. It’s more expensive at $89.99, but it’s also a far superior bag. It’s durable, rugged, and still makes me look somewhat respectable. If you’ve been following my blog, you probably know how much I love Cotopaxi from my reviews of my Volta and my Luzon. The Kpang is just as awesome. It has a cushioned pocket dedicated to your laptop or electronics, several useful compartments, and an internal sleeve just the right size for a water bottle. The shoulder strap is strong, and the cushioning is fantastic; it supports a lot of weight while remaining comfortable. The only flaw is that the underside of the shoulder pad is nylon; since my coat is made of a similar material, the two slide right off of each other. I’ve found myself slinging it cross body, and using the nylon handle more often. I do like that handle though; it feels like a soft seat belt doubled over on itself, and is really nice in the hand. This superb bag is expensive compared to the Rothco, sure, but compared to bags of comparable quality, the Kpang is a steal. I love the Navy Blue, but there are other options available as well. Of course, don’t forget that Cotopaxi supports adventurous lifestyles while funding efforts to meet the needs of those living in extreme poverty, by working to improve health, education, and job skill development. “Gear for Good” isn’t just a slogan, it’s a mission that the company and its employees stand behind. Headphones: I’ve owned a number of different headphones in my lifetime, and I’ve come to the conclusion that most of them are terrible. My all time favorite pair was, no joke, the simple white earbuds that came with my 5th Generation iPod Classic. I used these earbuds from 2005 until 2015 with no problem other than replacing the little cheap earbud padding. After a decade of service, they finally started to drop sound after I ran the Bix this summer, and so I decided to retire them. Now I’m using the earbuds that came with Clarissa’s latest iPhone. I don’t like them quite as much as my old classic earbuds, but they’re getting the job done. They were also essentially free, which is a bonus. Pencils/Pens: Since I’ve yet to find a good way to carry a pencil in my pocket, I try to always keep one or two in my work bag. I’m not a pencil snob, I just need something that will write and not smear too badly. That being said, I also carry a nice silver Cross pen and pencil that my mother gave me several years ago, which are doubly handy in case I have to fend off any werewolves. Legal Pads: Ever since my days as an undergraduate, I have eschewed notebooks and have instead done the majority of my work on legal pads. My preference is the yellow paper, but my current job supplies white legal pads, so that’s what I currently have in my bag. No big secret, I just like legal pads. 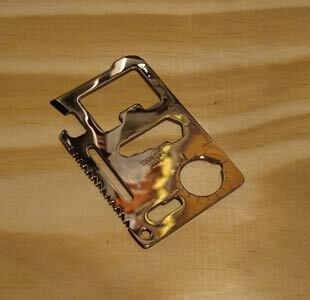 Survival Pocket Tool: To be honest, I don’t recall when I bought this thing, but it’s been in my bag for years. I have used a few of the different tools from time to time, but truth be told, nothing on here is better than using my Swiss Army Knife. Still, it’s nice to have a redundancy in my kit that takes up almost no room, weighs next to nothing, and is so inexpensive that I don’t ever worry about losing or breaking it. Seriously, it’s so cheap that everyone should get one as a stocking stuffer this year to keep in their glove compartment, backpack, or purse. I wouldn’t want this to be my only tool when alone in the wilderness, but it’s nice to know that it’s in my satchel, just in case. First Aid Kit: Obviously you need to be carrying a First Aid Kit when you’re out in the field, but if you have the space, it’s a good idea to carry a small one with you in your bag as well. That’s what I do. Very seldom have I had to use it, but again, it’s just nice to have a few basics with me in case of a small accident. Lifeline Trail Light Dayhiker First Aid Kit. There isn’t anything in this kit that will heal any serious injuries, but for the bumps, nicks, dings, small cuts and bruises of office life, it’s perfectly suitable. You can find small kits at pretty much any store, but I really like this Lifeline Trail Light Dayhiker First Aid Kit. It has almost everything you need, and I like the bright orange nylon case. Water Bottle: Like many people, I don’t drink enough water. I’ve tried to improve this, with some modicum of success, by making sure I’ve always got my water bottle with me. I’m particularly fond of this one, made by Thermos. It seals very well, and I’ve never had a leak in my bag. Having ruined paperwork and flash drives with other bottles in the past, that’s an important feature. It keeps my water well insulated, so I always get a nice cool drink, and I’ve slapped some stickers on there for purely cosmetic reasons; I’ve got one from Cotopaxi, another from Woosah Outfitters and Printshop, and a third of Rocket Raccoon. These are the things I carry with me every day. Sometimes there is a little more variety, and obviously if I’m going to the gym, working in the shop, or trekking out in the woods, I’m carrying a different kit than if I’m in the office. Keep in mind that this isn’t the end all be all of Every Day Carry; your needs are different from mine, so you may find that you require something that I don’t. You may also have skill sets that I don’t, enabling you to use tools that I can’t, or that keep you from needing tools that I do. What are some of the essentials that you carry with you on a daily basis? Share in the comments and let me know what makes up your EDC. 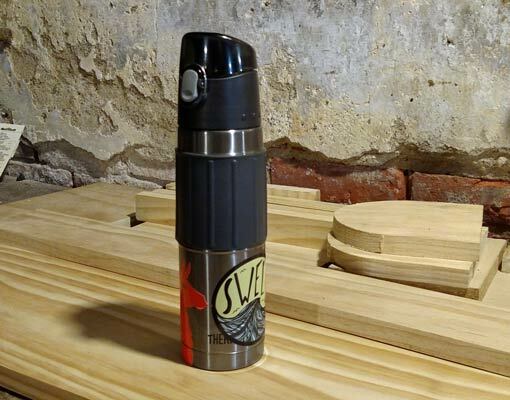 Want to win your own Spartan Swiss Army Knife, like the one I carry? Awesome, because I’m giving away two of them! There are two ways to enter, and you can do both, doubling your chances to win. Method 1. Follow me here on WordPress and comment on this post describing what’s in your Every Day Carry kit, and how the Swiss Army Knife will complement that. Method 2. 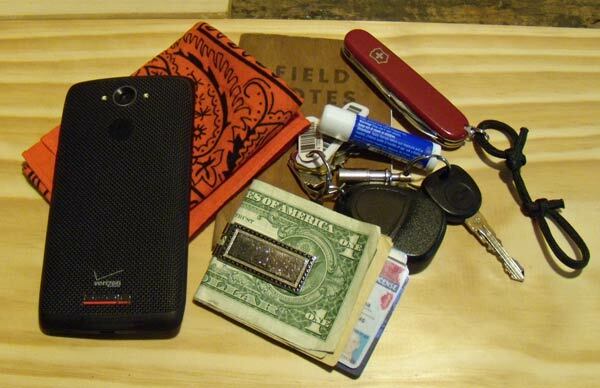 Follow me on Instagram, then post a photo of your own Every Day Carry supplies. In the caption, share how you think the Swiss Army Knife will complement your gear, tag me, tag a friend who you think will be interested in this giveaway, and be sure to use the hashtag #IntrepidSAK. You can enter both ways for two chances to win. The last day to enter is December 19th and I will announce the winners on December 20th! I look forward to reading/viewing your entries! I hope reading about my EDC will help you to think about what you’re carrying around with you and perhaps how you can be better prepared for whatever comes your way. You never know when an emergency might strike or an opportunity might knock, so make sure you’re ready for anything an intrepid life might lead your way. Take Advantage of this Powerful *Free* Tool? I love Swiss army knives, and used to keep my keys on mine. It went everywhere with me, until came the day when we were no longer allowed to take them on planes. So now I have a tiny-but-powerful torch with a key ring on it. I had a really hard time on my recent trip to LA; I didn’t check any bags, so I couldn’t take my SAK with me. It sounds ridiculous, but I’m so used to having it with me that I felt really off without it in my pocket! My every day carry kit is somewhat of an urban one these days. Aside from wallet/phone/keys, I also keep a few things tucked away in my car – sweatshirt, flash light, granola bars. I’ve used all of these items when I wasn’t planning to, so they’ve come in handy. Back in the day in Boy Scouts I had a knife, matches in a waterproof vial, and a first aid kit. If you spend your time in an urban environment, it’s best to have an urban kit. You’ve got to be prepared for what you’re likely to encounter, even if that’s not what’s in survival manuals and the like! Seth, I’ve selected you as one of the winners of my giveaway! Would you contact me so that I can get your shipping information? Please and thank You! Chapped lips are absolutely no fun! My wife is something of a chapstick addict! Jennifer, I’ve selected you as one of the winners of my giveaway! Would you contact me so that I can get your shipping information? Please and thank You!